This is the latest in the popular Nintendo fighting series Super Smash Bros. (and the Nintendo 3DS version is the first portable game in the franchise.) It is being worked on the teams at Namco Bandai and Project Sora, and features a mix of classic characters and new heroes such as the Animal Crossing Villager, Mega Man, and Little Mac. The changes Nintendo has made in Super Smash Bros. Ultimate imply that they are finally, thankfully, listening to the competitive community. Need a guide to all the tournaments, cosplay, musical performances, and more at DreamHack Atlanta? We've got you covered! Nintendo will roll into E3 2017 with a new look and a new attitude! And it's hype they'll want to capitalize on. There were some fantastic releases on both consoles -- here's our pick of the bunch. Over a short four years, the Wii U brought memorable titles and experiences, but never really had a clear focus. With the Switch on the horizon, we look at the ups and downs of the Wii U. These 8 games are guaranteed to be at EVO in July. But fans get to pick which title fills the last open slot. The remaining Smash Bros. amiibo may be arriving with a port of one of the Wii U's bestsellers. Here are some tips on how to get the best out of Mario in Smash for Wii U. A top level overview of the major fighting game franchises and the mechanics that make them great. Panda Gaming picks up Trela. As if their roster wasn't stacked enough. These Super Smash Bros. items will ensure that your battles are as wild as can be. Lupe Fiasco wants to get back in the ring with another fighting game pro. This time, it's ZeRo, who is arguably the best Smash 4 player in the world. Evo 2016's entrants for Super Smash Bros Wii U break registration records for any Super Smash Bros tournament ever. A motionless Luigi is nothing to be trifled with. 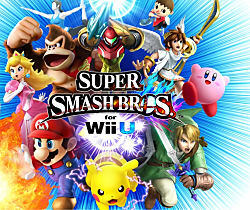 No one has reviewed Super Smash Bros&period; for Wii u yet! Played Super Smash Bros&period; for Wii u yet? What did you think?